Not to be confused with Central Swedish lowland or Central Belt. The Central Lowlands or Midland Valley is a geologically defined area of relatively low-lying land in southern Scotland. It consists of a rift valley between the Highland Boundary Fault to the north and the Southern Uplands Fault to the south. The Central Lowlands are one of the three main geographical sub-divisions of Scotland, the other two being the Highlands and Islands which lie to the north, northwest and the Southern Uplands, which lie south of the associated second fault line. The Central Lowlands is largely underlain by Paleozoic formations. Many of these sedimentary rocks have economic significance for it is here that the coal and iron bearing rocks that fueled Scotland's industrial revolution are to be found. This area has also experienced intense volcanism, Arthur's Seat in Edinburgh being the remnant of a once much larger volcano active in the Carboniferous period some 300 million years ago. This area is relatively low-lying, although even here hills such as the Ochils and Campsie Fells are rarely far from view. In common with the rest of Scotland the whole region was affected by Pleistocene glaciations. The Highland Boundary Fault runs from North Glen Sannox on the Isle of Arran in the south and west through the Isle of Bute and Helensburgh, then forms the northern boundary of Strathmore before reaching Stonehaven in the north east. The fault was active during the Caledonian orogeny, a plate tectonic collision which took place from Mid Ordovician to Mid Devonian periods (520 to 400 million years ago), during the closure of the Iapetus Ocean. The fault allowed the Midland Valley to descend as a major rift by as much as 4000 metres and there was subsequently vertical movement. This earlier vertical movement was later replaced by a horizontal shear. The Southern Uplands Fault runs from the Rhins of Galloway in the west towards Dunbar on the east coast 30 miles (50 km) from Edinburgh. A productive combination of fertile low-lying agricultural land and significant deposits of economically valuable coal and iron have led to the Central Lowlands being much more densely populated than the rest of Scotland. The major cities of Glasgow, Edinburgh, Stirling and Dundee all lie in the Central Lowlands, and over half of Scotland's population lives in this region. ^ "Loch Lomond - Highland Boundary Fault". Scottish Geology. Hunterian Museum and others. 2006-07-20. Archived from the original on 2011-02-25. Retrieved 2006-12-13. ^ "Highland Boundary Fault". Gazetteer for Scotland. University of Edinburgh and Royal Scottish Geographical Society. Retrieved 2006-12-13. ^ "Southern Uplands Fault" Archived 2005-12-19 at the Wayback Machine Gazetteer for Scotland. Retrieved 11 January 2008. 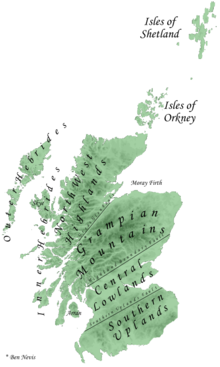 ^ "Regional Geology, Southern Uplands - Map" Scottishgeology.com. Retrieved 21 March 2008. Gillen, Con (2003) Geology and landscapes of Scotland. Harpenden. Terra Publishing. McKirdy, Alan Gordon, John & Crofts, Roger (2007) Land of Mountain and Flood: The Geology and Landforms of Scotland. Edinburgh. Birlinn.